Low Salary Increases the New Norm? Salary increases at all levels remain low, and are likely to remain so, according to latest survey. Salary increases at all levels remain low, and are likely to remain so, according to the latest pay survey conducted by remuneration specialists MHR Global Ltd.
New Zealand’s longest established commercial survey has been running since 1959, and analyses over 35,000 individual records from 416 organisations throughout New Zealand. 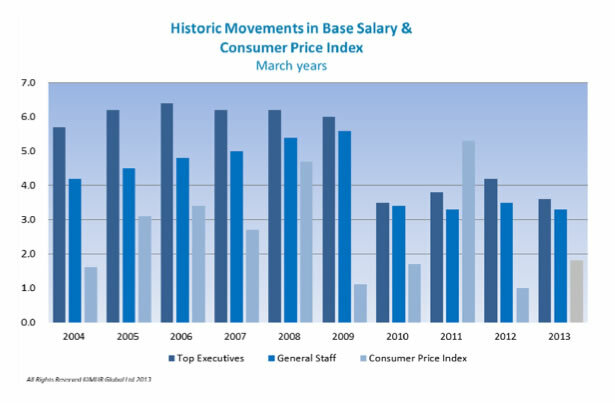 The latest update as at 1 March 2013 found that over the 12 months to March 2013 base salaries rose by an average of 3.8 percent for Chief Executives and General Managers, 3.6 percent for Top Executives (including CEOs and direct reports), and 3.3 percent for all other staff. Balancing the low increases to some extent is the fact that the number of staff receiving increases has lifted back to pre‐2010 levels of around 70 percent, a marked improvement from recent years in which the proportion of staff receiving increases fell to close to 50 percent as employers sought to contain costs to cope with reduced revenue and funding. The survey also shows that movements in median total remuneration – an aggregate of changes in base salary, benefits and bonuses, and appointment levels for new appointments – remain low, with an increase of just 2.3 percent in Median Total Remuneration for roles below Top Executive level. If you would like to find out more about our products and services please contact us by telephone or email.